I don’t know about you, but after feasting all through the holidays on tamales, pozole, pan dulce, and champurrado, my body craves lighter fare in the new year. I decided to look at some traditional Mexican dishes and figure out a way to make them healthier or lower the carb count in them. 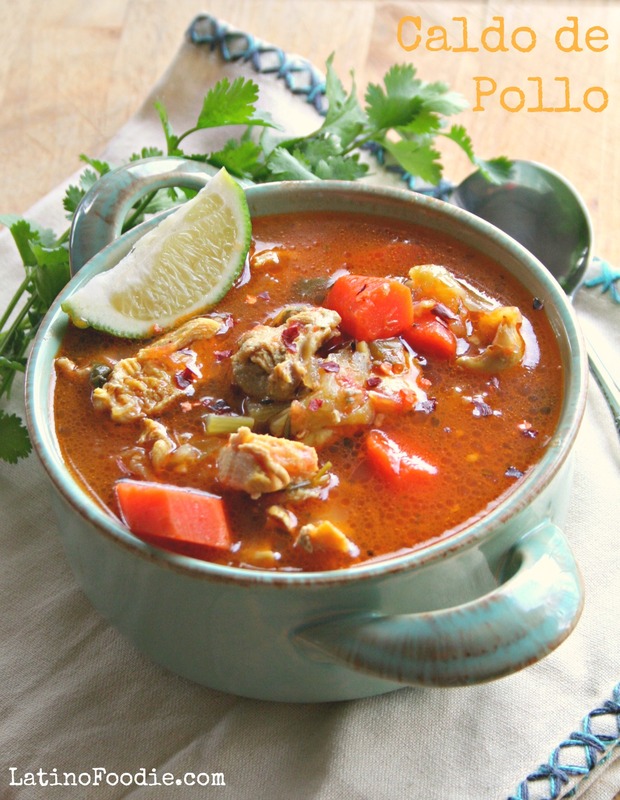 Here’s my version of a low-carb version of Caldo de Pollo. Just like any homemade chicken soup, Caldo de Pollo feeds the soul and brings beautiful memories of childhood when my mom would prepare a large olla (stock pot) of the soup. At the dinner table, I’d watch my dad add a bowl of Mexican rice to his soup and slather butter on a warm flour tortilla that he’d roll up to dip into the broth. The caldo was filled with pieces of chicken — drumsticks and thighs — as the breast would leave too many small bones. Large pieces of carrots and potatoes nestled close to the tender chicken. Her broth tasted more like a light, flavorful consommé. I’ve taken that traditional recipe and omitted the potatoes, side of rice and didn’t even dare bring out the flour tortillas to create this low carb version of Caldo de Pollo. You know what? I didn’t miss any of those things at all, well, maybe the flour tortillas but those are truly my weakness. Check out the recipe below and let me know what you think. Comfort food at its best - Caldo de Pollo. This recipe removes the potatoes and rice you would typically find with this dish. In a large (at least 10-quart) pot, add the water, chicken, salt, and garlic. Bring to a boil for about 15 minutes. While the chicken is boiling, in a medium frying pan heat the olive oil and add the onions and tomatoes. Saute for about 5 minutes until the onions are translucent. Add the carrots, celery, cabbage to the soup and let the mixture come to a boil. Reduce the heat and add the apple cider vinegar and butter. Stir frequently. Allow the soup to simmer for about 20 minutes. Add the tomato and onion mixture and cilantro during the last 10 minutes of cooking. Ladle the soup and serve with lime wedges and homemade salsa.